Lap Joint Flanges (Loose Flanges) are used with a corresponding stub-end that “inserts” in the inside of the flange. The main benefit of this type of flange, is that once the pipe welds to the insert stub-end, the flange then can rotate for easier alignment of the bolting holes. However, lap joint flanges and their stub-ends’ ability to hold pressure is about the same as slip-on flanges. They are not suitable for situations with a high external or changing loads of force. They do provide an advantage in a piping system that needs frequent dismantling for inspection or to remove build-ups. ANSI/ASME B16.5 Class 300 Lap Joint Flanges (Loose Flanges) are used in Chemical and petrochemical processing. 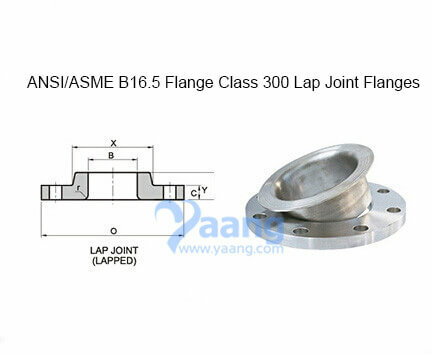 ANSI/ASME B16.5 Class 300 Lap Joint Flanges (Loose Flanges) are used in electronics. ANSI/ASME B16.5 Class 300 Lap Joint Flanges (Loose Flanges) are used in processing equipment for maintaining product purity in handling foods, synthetic fibers. ANSI/ASME B16.5 Class 300 Lap Joint Flanges (Loose Flanges) are used in marine and offshore engineering. ANSI/ASME B16.5 Class 300 Lap Joint Flanges (Loose Flanges) are highly resistant to various reducing chemicals. ANSI/ASME B16.5 Class 300 Lap Joint Flanges (Loose Flanges) are excellent resistance to caustic alkalies. ANSI/ASME B16.5 Class 300 Lap Joint Flanges (Loose Flanges) are high electrical conductivity. ANSI/ASME B16.5 Class 300 Lap Joint Flanges (Loose Flanges) are excellent corrosion resistance to distilled and natural waters. ANSI/ASME B16.5 Class 300 Lap Joint Flanges (Loose Flanges) are resistance to neutral and alkaline salt solutions. ANSI/ASME B16.5 Class 300 Lap Joint Flanges (Loose Flanges) are excellent resistance to dry fluorine. ANSI/ASME B16.5 Class 300 Lap Joint Flanges (Loose Flanges) are widely used to handle caustic soda. ANSI/ASME B16.5 Class 300 Lap Joint Flanges (Loose Flanges) are good thermal, electrical and magnetostrictive properties. ANSI/ASME B16.5 Class 300 Lap Joint Flanges (Loose Flanges) offer some resistance to hydrochloric and sulfuric acids at modest temperatures and concentrations.